This page shows install points for original Super Nintendo / Super Famicom systems that aren’t the 1CHIP or Mini / Jr. Models. Each SNES / Super Famicom system uses one of two audio chips listed on the main SNES Digital Audio Page. The pinouts on the chips are always the same, but the via’s are different on each motherboard revision. I wanted to create a page to show the installations I’ve done, as well as their most convenient install points. I’ll update this page each time I install the board in a different revision system. 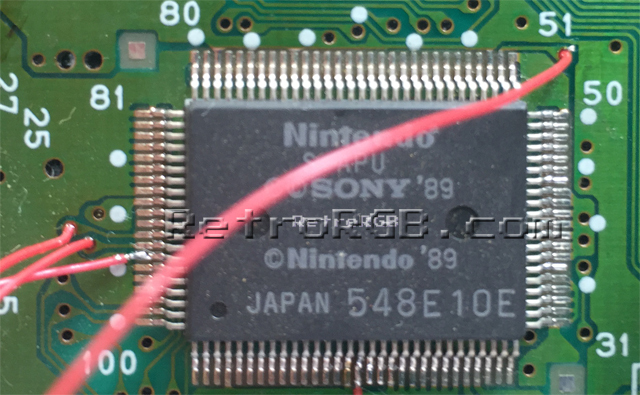 For installation in your system, you’ll need to follow the SNES 1CHIP Digital Audio instructions exactly; The only difference will be the solder points for the audio chip. That’s all I have for now, but I’ll add more as I come across them. Feel free to email me pics if you’d like to contribute to this page.